All vital records for Clare County, birth, death, marriage, and others, are available from 1871 to the present. Researchers should contact the County Clerk to inquire further. Due to space requirements, two researchers are allowed in the genealogy area at once, and additional individuals will be asked to wait until space frees up. Copies of records are $10, and $4 for extras. The office opens at normal business hours Monday through Friday but closes at 3:00PM. 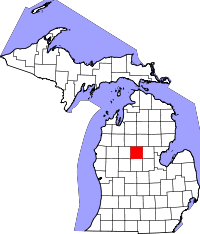 Clare County was one of several counties in Michigan renamed around 1840 with Irish names as a tribute to the burgeoning Irish and Scottish populations. It was named after County Clare in Ireland. Au Sable State Forest, previously a large lumber source, is located within Clare. The forest was converted to a state forest after lumber operations and wildfires all but stripped it clean, but it has rebounded into a valuable area to Michigan in the years since.